Thanks to Cindy Scott for nominating me for this year’s Liebster Award. Here are my answers to her questions—and I’ve added my own and nominated a few people at the end of this post. Thanks, Cindy! Who is your mentor? And why? I don’t know if I have a mentor. I do have a lot of writers whose work has inspired me—Ursula K. Le Guin, J.K. Rowling, Jane Austen, and Yasmine Galenorn, to name a few. If you could take only 3 books to the Eloi (The Time Machine by H.G. Wells) in the far future, what 3 books would you take? Hmm. That’s a tough one. I guess I’d have to say “Pride and Prejudice” by Jane Austen, “Harry Potter and the Order of the Phoenix” by J.K. Rowling and “The Left Hand of Darkness” by Ursula K. Le Guin. What is the one food you hate the most? Why? Peaches. They’re fruit that’s fuzzy. Yes, I know it’s irrational, but there it is. If you could sit down with 1 famous person (alive or dead for lunch/coffee/tea), whom would it be? Why? Jane Goodall. She seems like a very humble, down-to-earth person, she’s super compassionate, and she has done amazing things in the world. Biggest fear, what is it? If you could perform/act/sing with one person, whom would it be? Why? Oh, that’s tough. Jim Parsons (Sheldon on “The Big Bang Theory”) because he’s a king of visual comedy. Not sure I could keep a straight face, though. I believe life is about the simple pleasures and the people (or creatures) we share them with. Drinking tea with an old friend, snuggling up to watch a movie with our significant other, a day spent hiking or reading poetry in the summer sunshine. One: Buy a house, preferably one with a nice yard where I can grow roses. Two: Take a trip to some place I’ve never been before—maybe California or Hawaii. Three: Donate to the local animal shelter. 1.) What most inspires your writing? 2.) It’s a cold and stormy night. What book do you curl up with? 3.) What was your favorite book when you were growing up? 4.) Who is your greatest inspiration? 5.) What’s your favorite movie? What do you love about it? 6.) Dark chocolate, milk chocolate, white chocolate, or no chocolate? What’s your preference? 7.) If you could travel to any place, real or imagined, where would it be? 8.) What do you do when you’re not writing? 9.) What’s your hidden talent? 10.) If you were a supernatural/paranormal creature/being, what would you be and why? 2.) Read four books on the craft/business of writing. 3/4. No progress to report. 3.) Do morning pages in journal Monday-Friday. 5/5. Goal met. 3.) Comment on three-five blog posts daily, Monday-Thursday. Goal met! Thank you, Denise! 🙂 I can’t wait to answer your questions. Though, I do have to wait. Can you believe another snow day? Tomorrow it will be the first blog post I write. Promise! You’re welcome, Gloria. Looking forward to hearing your answers. ~w00~ for writing 1,999 words. Did that happen to end on the 1999th word or were you aiming for it? 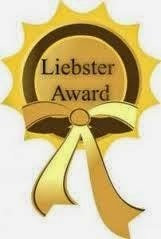 Aww, thanks for the Liebster Award! Now I know what I’m blogging about next week. I don’t think I’ve ever met anyone who doesn’t like peaches LOL. Your answers were fun! You’re welcome, Jennette. I look forward to reading your answers. And yes, the peaches thing is random, but there it is.